This is exactly why social media is great. It's all about sharing! 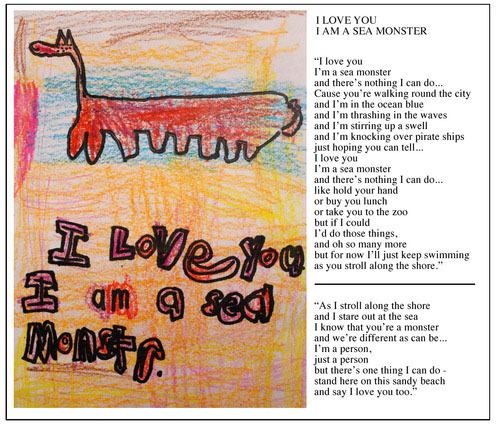 A couple days ago, I posted artwork that my 1st and 2nd grade students made after being inspired by Dallas Clayton's artwork. I posted it on Twitter and tagged @dallasclayton. He posted the drawings on his website. 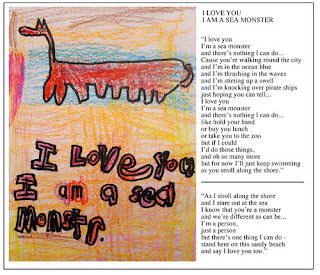 Someone told him that I Love You I am a Sea Monster would make a great film, and it inspired him to write a poem! I can not wait to show this to my students, who will surely feel like celebrities (in a good way.) Thank you, Dallas Clayton! I love this. Social Media is wonderful! The poem makes me laugh. Awesome, you go girl! Dallas rocks!